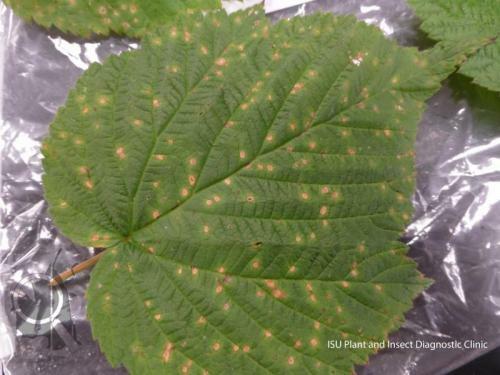 Raspberry leaf spot is perhaps the most common raspberry disease we see in the clinic. Raspberry leaf spot is caused by a fungus called Sphaerulina rubi. This fungus overwinters on leaves and canes which then serve as sources of infection in spring. Young leaves are highly susceptible to this disease, but older spots or lesions produce spores that are readily spread by rain or wind to new tissues throughout the entire season. Early infections look like dark green circular spots on new leaves. As leaves get older, spots become light tan to gray. Severe infections cause leaves to fall off in late summer and early fall and this may not only reduce your raspberry harvest, but it also makes plants more prone to winter injury. For pictures, please click on the "Raspberry Leaf Spot" link to the right. Cultural measures that increase air circulation are probably the most effective way to control this disease. Since this fungus thrives under high humidity conditions, promoting faster drying of leaves and canes after rain can reduce the chances of infection. The easiest tactic is to start off with properly spaced plants between and within rows, and in established plantings, avoid too many canes per plant. Also, reduce the sources of infection by pruning out old fruiting canes and removing them from the field. A fungicide program for Gray mold can be effective to control this disease. Also, timing applications and product recommendations can be obtained from the "Midwest Small Fruit and Grape Spray Guide".